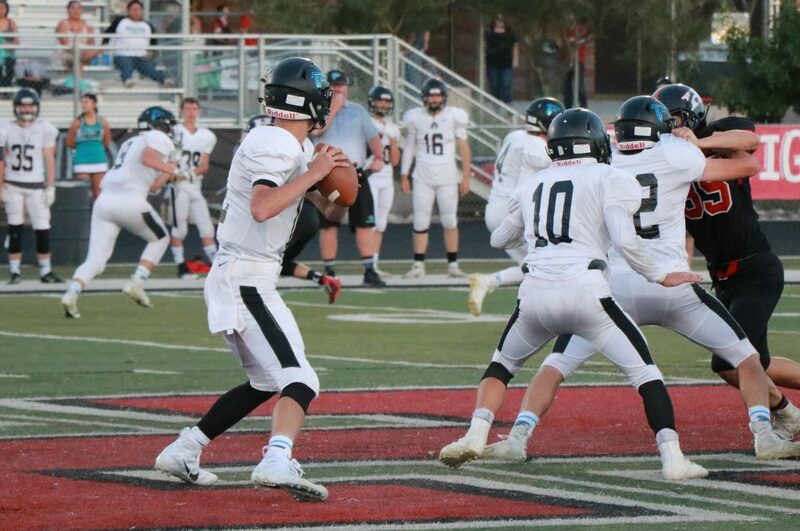 The Desert Hills Thunder escaped with a narrow victory Friday night, nailing a 35-yard field goal with 1.9 seconds to play. The Thunder scored first when Logan Wilstead pushed the ball over the goal line at the 8:11 mark of the opening quarter. Following the PAT, Desert Hills led 7-0. The Redmen countered with a score of their own, using a 74-yard drive, capped off by a 6-yard run from Jaxon Garrett to even the score at 7-7 with two minutes to play in the first. Saul Andrus made the score 14-7 Thunder when he caught a touchdown pass on third-and-goal at the 7:20 mark of the second quarter. Desert Hills took a 21-7 lead just before halftime when Wilstead scored from 1-yard out, his second rushing touchdown of the half. Cedar wasn’t about to go down easy though, scoring with just 56 seconds left in the third quarter courtesy of a 1-yard touchdown run from Drake Fakahua, cutting the Thunder lead to 21-14. 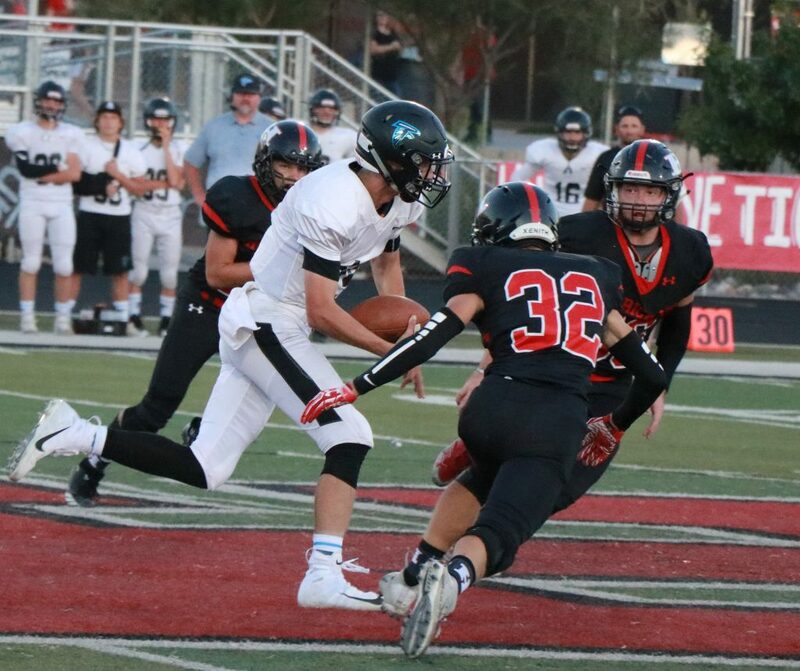 After Desert Hills scored two points on a safety and the Redmen made a field goal, Cedar quarterback Jaxon Garrett led a last-minute drive, delivering a 12-yard touchdown pass to Jack Cook. After a made extra point, Cedar took a 24-23 lead with just 13.8 seconds to play. Desert Hills’ Cage Baird flew down the sideline, setting up a 35-yard field goal opportunity. With just 1.9 seconds on the clock, Logan Callister drilled the field goal, giving the Thunder an exciting 26-23 victory. With the win, Desert Hills moves to 4-2 overall, and a perfect 3-0 in region play. Cedar drops to 2-4 overall, 0-3 in region play with the loss. 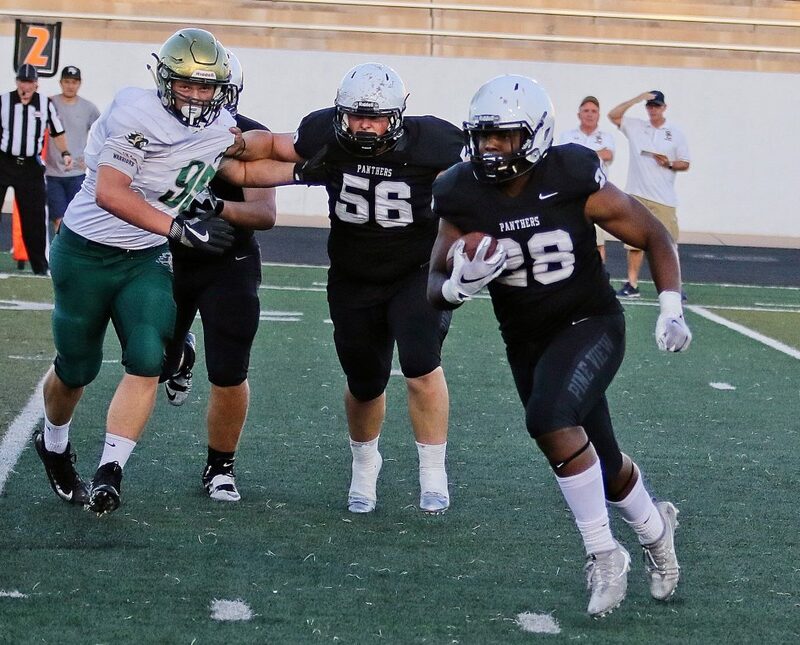 Desert Hills travels to Canyon View next Friday, with kickoff at 7 p.m.
Cedar will host Hurricane on Friday at 7 p.m., looking for their first region win of the season. 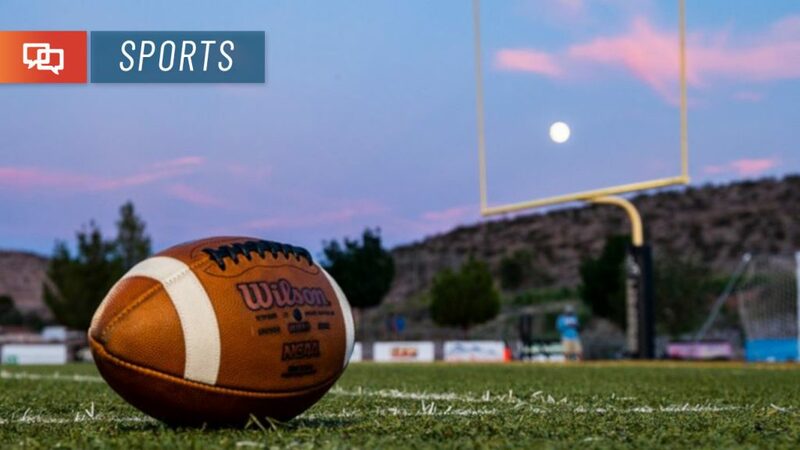 The Pine View Panthers broke open a close game in the second half, defeating visiting Snow Canyon 41-13. One of the top-scoring offenses in 4A, the Panthers struggled in the first half. However they returned to form in the second half, scoring 27 points and rolling to a victory. The Panthers took an early 7-0 lead when quarterback Dallin Brown scampered into the end zone from four yards out at the 5:45 mark of the first quarter. After a touchdown by Snow Canyon made the score 7-7, Pine View answered, scoring with just under three minutes left in the first half, taking a 14-7 lead into the locker room. The Panthers started clicking in the second half, taking a 21-7 lead in the third quarter. Dallin Brown threw a touchdown pass on the next series, sending a 20-yard pass to Daylor Rymer for a 28-7 lead. 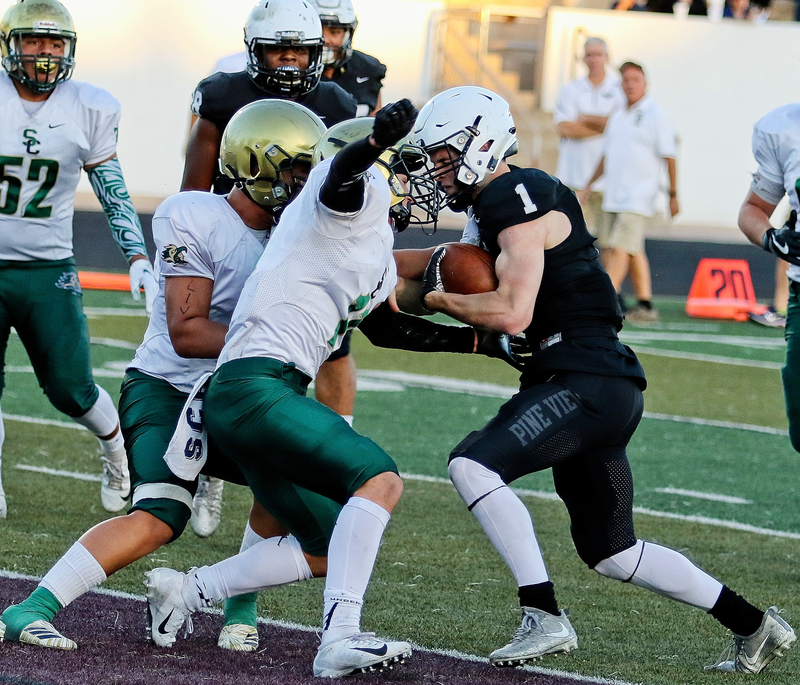 The Panthers added another score just two minutes later when Dallin Brown caught an 8-yard touchdown pass, giving Pine View a 35-7 lead. After a Pine View field goal, Snow Canyon running back took the ball 82 yards to the endzone, one of just two of the Warriors touchdowns. The Panthers sealed the win with another field goal, capping off a 41-13 blowout victory. 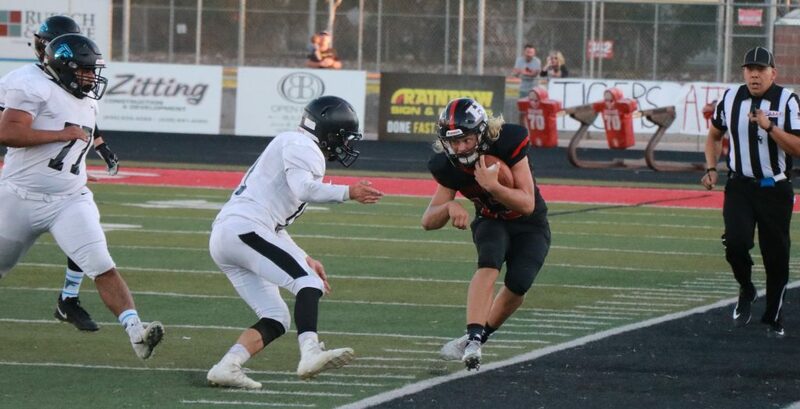 The Panthers were led by Dallin Brown, who completed 10 of 17 passes for 93 yards while rushing for 180 yards on 20 carries, scoring four total touchdowns (1 pass, 1 receiving, 2 rushing). 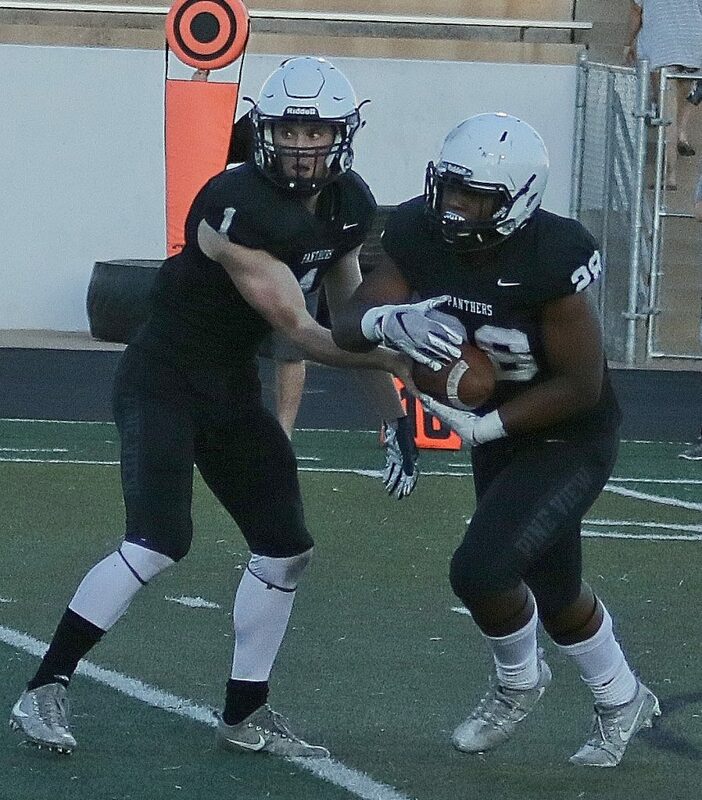 With the win, Pine View moved to 4-1 overall, 2-0 in region play. Snow Canyon dropped to 1-5 overall, 0-3 in region play with the loss. Pine View will take on Dixie next Friday with both teams perfect in Region 9 play. The game will kick off a 7 p.m. Snow Canyon will have a bye week, followed by a matchup against Cedar on October 4. For the second week in a row, the Canyon View Falcons spoiled an opponent’s homecoming. This time, the victim was the Hurricane Tigers, who simply ran out of time at the end of a heartbreaking 41-27 loss Friday night. Canyon View scored first and led by as many as 14 points, but the Tigers came back to tie the game twice. Hurricane’s final TD brought them within 34-27 with 5:05 left in the fourth quarter. 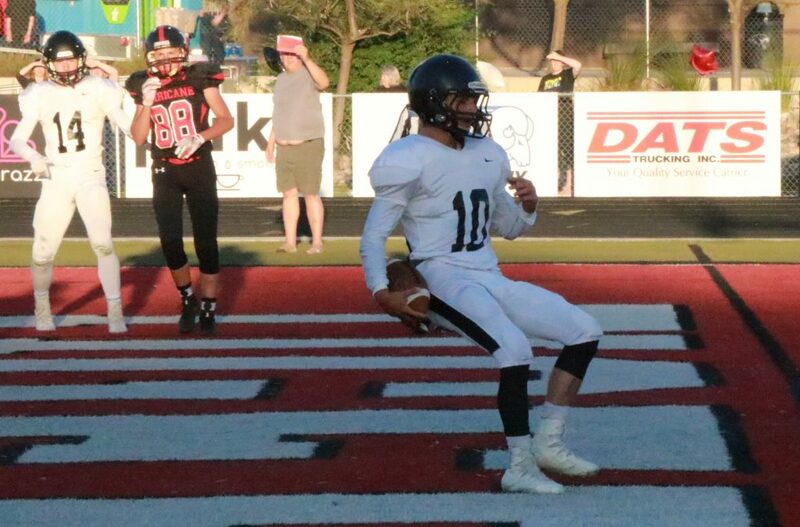 But on its ensuing possession, Canyon View drove the length of the field, using up the clock and scoring one last TD on a run by quarterback Colten Shumway to clinch the game. The Falcons got on the scoreboard on their first possession of the game, with Brady Lowry scoring a 1-yard rushing TD with 8:45 left in the first quarter. Hunter Talbot’s PAT kick was good, giving Canyon View an early 7-0 lead. 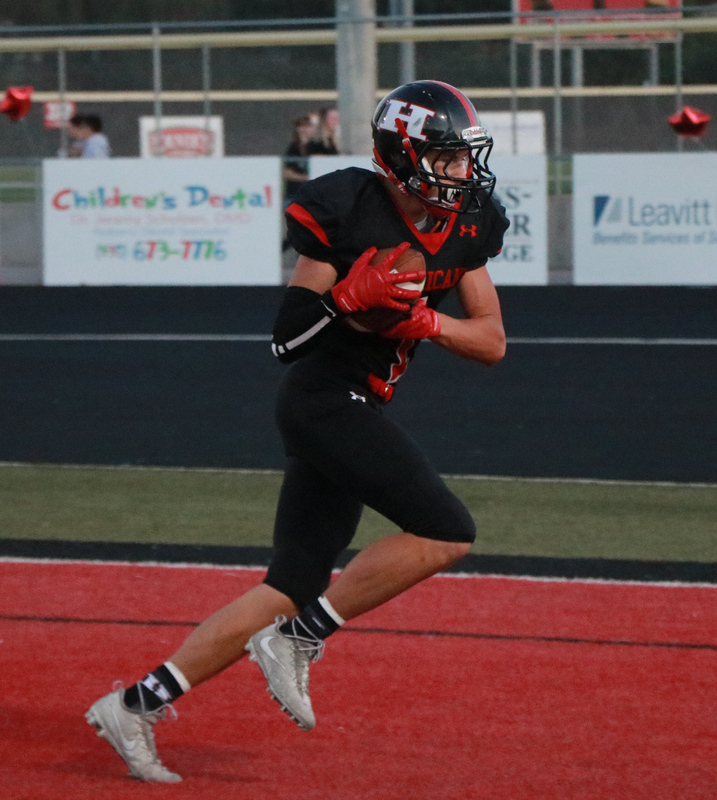 Hurricane fumbled the ball away at midfield on its first possession, and the Falcons capitalized almost immediately, as Shumway threw a 47-yard TD pass to Brayden Cavaleri with 6:13 left in the first. The PAT attempt hit the left goalpost and missed, making the score 13-0. Hurricane came back to scored two TDs during the second quarter, tying the game 13-13. The Tigers’ first score came on a 20-yard TD pass from Brock Starley to Ian Lambert, with Raymond Cordova kicking the extra point. The second TD came with just two minutes before halftime, when Hayden Eves rushed up the middle for an 8-yard score. The PAT attempt went low, leaving the score tied. Right after receiving the ensuing kickoff, Canyon View turned the ball over when Shumway threw an interception. But Hurricane wasn’t able to capitalize, despite being deep in Falcon territory. A couple penalties pushed the Tigers back, and they ended up punting. Canyon View took over again on their own 15-yard-line with 1:20 left in the second quarter. A couple plays later, Shumway broke loose for a 69-yard rushing TD with 30 seconds remaining before halftime, giving the Falcons a seven-point cushion at intermission, 20-13. Early in the third period, the Tigers tied the game again, thanks to an 11-yard TD run by Kyler Siddoway. 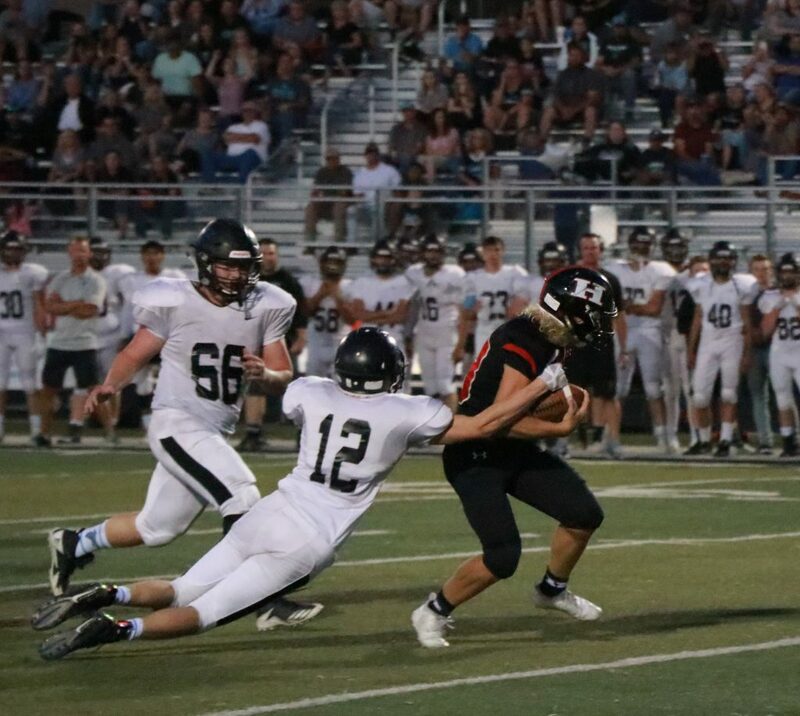 Canyon View then answered with a lengthy drive that culminated with Shumway bursting into the end zone on fourth-and-goal on the 1-yard-line. The PAT kick attempt was partially blocked, so the Falcons led 26-20 with just over four minutes left in the third. 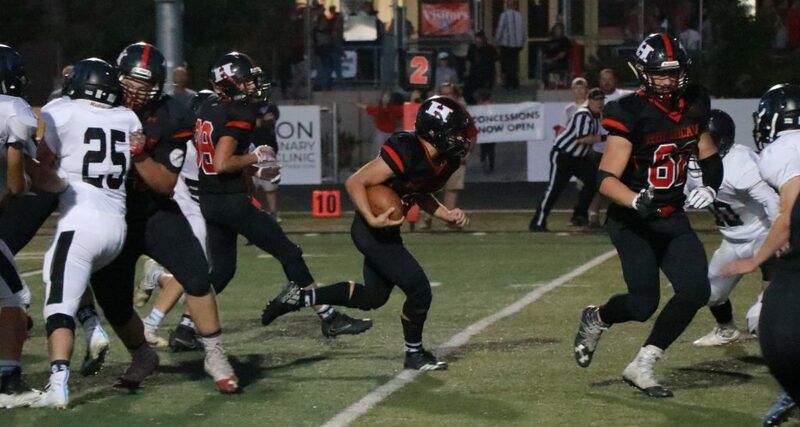 Hurricane punted on its next possession, after which the Falcons again engineered a long drive ending in a six-yard rushing TD by senior Hunter Anderson. The Falcons succeeded in making a 2-point conversion when Shumway passed to Lowry in the end zone, putting Canyon View up 34-20 with 10:21 left in the fourth quarter. Hurricane managed to score on its next possession, but the Tigers were hurt by penalties on three successive plays. Hurricane was able to make up the lost yardage, but the penalties ended up costing time on the clock. There was just 5:05 remaining in the game when Starley connected with Cordova for a 5-yard TD pass. Cordova’s PAT made it 34-27 with five minutes left. On its last possession, Canyon View managed to drive the length of the field and use up almost all the remaining time. Shumway scored a 2-yard TD in the closing seconds to account for the final 14-point margin. Canyon View head coach Chris Sawyers said a big challenge for the Falcons was to not suffer a letdown after last week’s 27-14 win at Cedar. “We told them all week, we know how hard it is to get back up for that second one after a big emotional win, and we didn’t do a great job of that at first,” Sawyers said. After winning both Cedar’s and Hurricane’s homecoming games over the past two weeks, Canyon View (3-3 overall, 2-1 in region play) will now turn its attention to its own homecoming contest next Friday, when the Falcons host Desert Hills (4-2, 3-0). 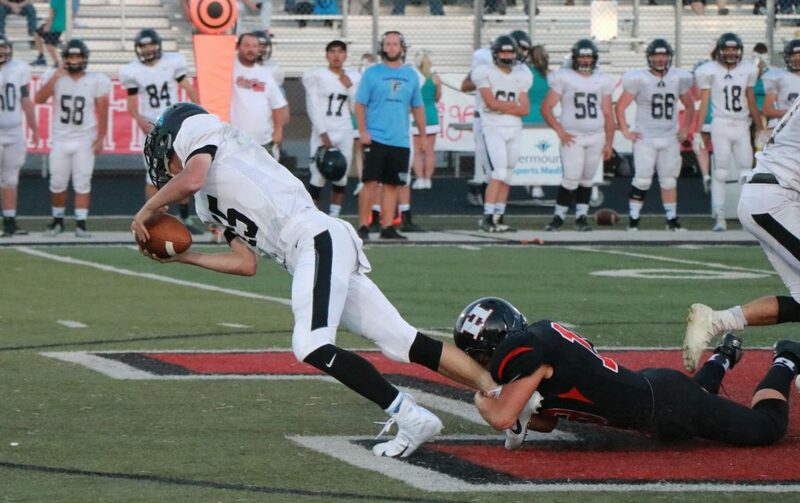 The Thunder edged past Cedar 26-24 on a late field goal Friday night. Hurricane (0-5, 0-2) plays its next game at Cedar (2-4, 0-3) next Friday.